Liven up learning as you help students understand abstract base ten concepts, including place value, estimation, operations, fractions, and more. Units are made of durable, washable plastic for years of hands-on activities. 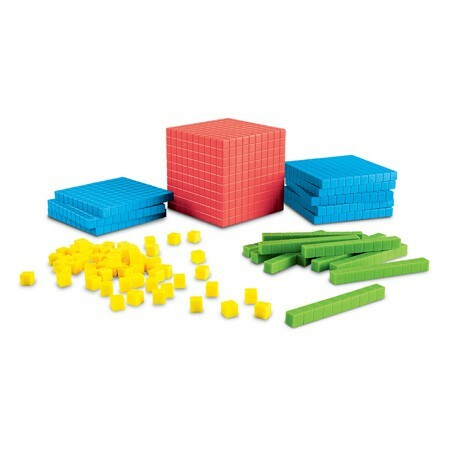 Common Core State Standards Alignment: Operations & Algebraic Thinking, Numbers & Operations - See more at: http://www.learningresources.com/product/brights%21--8482-+base+10+starter+set.do?from=Search&cx=0#sthash.vg5ktWrI.dpuf From Learning Resources. Liven up learning as you help students understand abstract base ten concepts, including place value, estimation, operations, fractions, and more. Units are made of durable, washable plastic for years of hands-on activities. Includes: • 1 cube • 10 flats • 20 rods • 100 units • Activity guide Grades: 1+. From Learning Resources.